You can use the projector's Keystone setting to correct the shape of an image that is unevenly rectangular on the sides. Note: You cannot combine Keystone correction with other image shape correction methods. 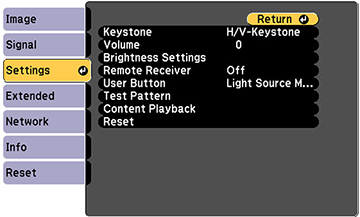 Note: You can also press the Keystone button on the remote control to display the Keystone adjustment screen. Select the Keystone setting and press Enter ( ). Select H/V Keystone and press Enter ( ). Then press Enter ( ) again. Use the arrow buttons on the remote control to select between vertical and horizontal keystone correction, and to adjust the image shape as necessary. When you are finished, press Esc. After correction, your image is slightly smaller.